Anhydrosis is the partial or complete loss of the ability to sweat. Tying up, otherwise known as muscle spasm or tension, involves chronic tension in the horse’s muscles due to overwork. Lymphangitis is an infection of the lymphatic system, usually in the legs. The bacteria get into the body by small cuts or scrapes and invade the lymphatic tracts. 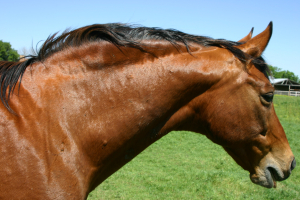 Learn more about what to do in the situation of lacerations or puncture wounds on your horse. Hives are an allergic reaction to environment, product or flies. This is an infectious or non-infectious disorder that results in inflammation, ulceration and/or crusting conditions affecting the pastern region of the horse. Laminitis is a disease of the lamina which attach the horse’s hoof wall and its coffin bone. The lamina can become inflamed and painful for a number of reasons. Abscesses are infections under the sole of the foot and are a primary cause for a sudden, dramatic lameness. Fortunately, early detection and proper care can bring your horse back to work and feeling better quicker.